Our baked goods are the perfect treat for Easter! Choose from our specials below, or let us know if you have something else in mind. Contact Us to order by Thursday, April 18. Free Delivery to the greater Houston area, or you can arrange pickup from our Heights-area kitchen. The breakfast basket comes with 4 buttery croissants. Our breakfast basket includes an assortment of 12 of our best pastries – you choose the flavors you want! Our large cinnamon rolls are extra gooey and made-to-order with pecans and our special cinnamon spice blend. Our 9” lemon tart serves 8-10 people. Our 10” blueberry cake is made with fresh blueberries and finished with a generous layer of our delicious crumb topping. Serves 10-12. 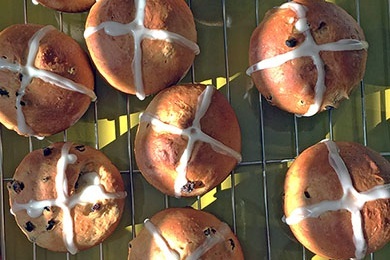 Hot Cross Buns – $12 / dz.